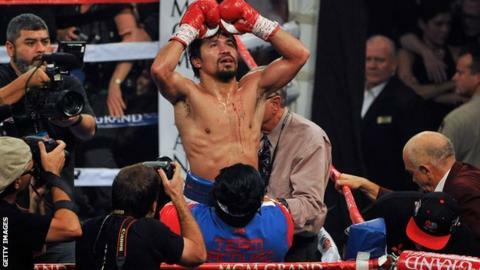 Manny Pacquiao is hoping to secure a long-awaited fight with unbeaten American Floyd Mayweather after winning the WBO welterweight title. The Filipino, 35, beat Timothy Bradley on points at the weekend. Pacquiao, who has won world titles in eight weight divisions, said of a possible bout against WBC welterweight champion Mayweather: "The line is open 24 hours, seven days a week. "If he wants to fight, the fight will be on." Pacquiao and Mayweather, 37, are generally considered the best fighters of their generation. Pacquiao is expected later this year to take on the winner of the fight between Juan Manuel Marquez and Mike Alvarado who meet on 17 May. He has fought Marquez four times and was knocked out by the Mexican in their last encounter in December 2012. Mayweather will put his 45-fight unbeaten record on the line against Argentina's Marcos Maidana in a world welterweight title bout on 3 May.